Every good gardener knows that you can't chop weeds. Try to go after those buggers with a weed eater, and you'll get nowhere in a hurry. You've got to rip weeds up by the roots. Otherwise, they will just keep coming back, and when they do, they're bound to bring more and more of their weedy friends. It's no accident that God uses the image of a weed to describe a particular sin that has a way of creeping into all of our hearts . . . bitterness. Bitterness isn't one of those big, flashy sins that you can see growing above the surface of our hearts. It may not show off like anger or produce big ol’ hunks of rotten fruit like disobedience. Bitterness is a sleeper sin. It grows beneath the surface, down deep in the soil of our hearts. But the author's warning in Hebrews is clear—that bitter root will one day sprout, and when it does, “many will become defiled.” In other words, if that bitter root keeps growing, there will be a harvest of pain for you and the people in your world. And because bitterness is a weedy sin that burrows in our hearts first, we can't just cut off the behaviors that bitterness causes. (We will get to those in a minute.) We need the Lord's help to yank that baby up by the root. If we don't deal with bitterness, that bitterness will progress toward extreme anger (that's wrath). If we don't deal with the anger, we will start to clamor or demand what we want. If that doesn't work, we will start to talk bad about the object of our bitterness in the hopes of recruiting others to agree with and justify our feelings (that's slander). With so much on the line, it is wise to ask ourselves often, "Am I bitter?" Since bitterness is a sleeper sin, the answer isn't always obvious. 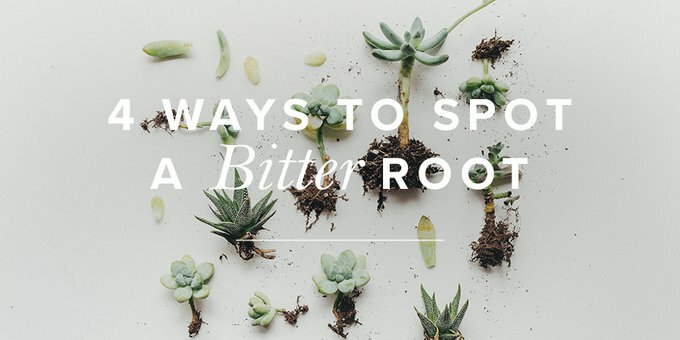 Here are four questions to help you spot a bitter root. There’s a connection between the junk that comes out of our mouths and the bitterness that tends to take root in our hearts. Do you find yourself losing your cool often? Are you critical, snappy, rude? Do you find you cuss more easily following your interactions with someone who has hurt you? Maybe the sins you’re committing with your mouth are simply an extension of the bitterness that you’ve allowed to grow in your heart. If you’re trying to deal with the way you speak and gaining no ground, it's possible that you need to dig deeper and yank out the root of the problem. Scientists have concluded that bitterness, if left unchecked, interferes with the body's hormonal and immune systems. Bitter people tend to have higher blood pressure and heart rate and are much more likely to die of heart disease and other illnesses. Of course, the apostle Paul didn't have access to this scientific data when he wrote much of the New Testament, but that didn't keep him from connecting the dots between bitterness and our bodies. In Acts 8:23, Paul describes the “gall of bitterness.” It's a bile, a bitter substance that can literally make us sick. Hop back on the blog Thursday as we consider how we can unearth the root of bitterness together. (Hint: We can’t). Have You Started a Forest Fire Today?